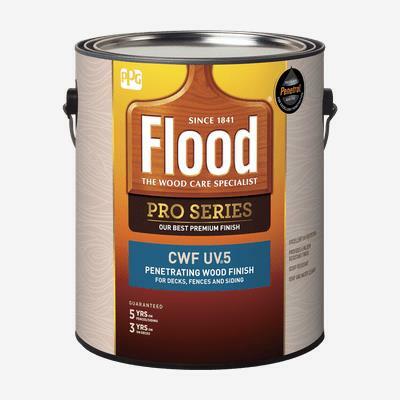 FLOOD® PRO CWF-UV®5 Penetrating Wood Finish offers advanced formulation that protects wood from the inside out to guard against moisture and sun damage while adding a slight hint of color. Fortified with PENETROL® for excellent penetration. Recommended for use on any properly prepared exterior wood, including decks, fences, siding, railings, outdoor furniture and other wood surfaces. Apply to new, dry, pressure-treated wood, uncoated new or weathered wood, or wood previously stained or painted. Apply directly to weathered wood previously finished with FLOOD® PRO CWF-UV®5; other previous coatings must be completely removed.